AND I saw when the Lamb opened one of the seals, and I heard, as it were the noise of thunder, one of the four beasts saying, Come and see. 2 And I saw, and behold a white horse: and he that sat on him had a bow; and a crown was given unto him: and he went forth conquering, and to conquer. 3 And when he had opened the second seal, I heard the second beast say, Come and see. 4 And there went out another horse that was red: and power was given to him that sat thereon to take peace from the earth, and that they should kill one another: and there was given unto him a great sword. 5 And when he had opened the third seal, I heard the third beast say, Come and see. And I beheld, and lo a black horse; and he that sat on him had a pair of balances in his hand. 6 And I heard a voice in the midst of the four beasts say, A measure of wheat for a penny, and three measures of barley for a penny; and see you hurt not the oil and the wine. 7 And when he had opened the fourth seal, I heard the voice of the fourth beast say, Come and see. 8 And I looked, and behold a green horse: and his name that sat on him was Death, and Hell followed with him. And power was given unto them over the fourth part of the earth, to kill with sword, and with hunger, and with death, and with the beasts of the earth. 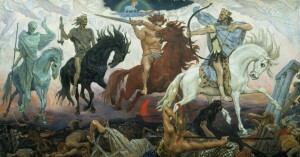 There we have it – four horsemen: white, red, black and green? Let’s take a look at the Greek for a change and see what is there. 8 And I looked, and behold a green (χλωρος – chloros) horse (ιππος hippos): and his name that sat on him was Death (θανατος thanatos), and Hell (Αδης Hadace) followed with him. And power was given unto them over the fourth part of the earth, to kill with εν sword, and with hunger, and with death, and with the beasts of the earth. χλωρος chloros; greenish, i.e. verdant, dun-colored:—green, pale. Strong’s 5515. AND I turned, and lifted up mine eyes, and looked, and, behold, there came four chariots out from between two mountains; and the mountains were mountains of brass. 2 In the first chariot were red horses (אָדֹם 'adom: rosy:—red, ruddy); and in the second chariot black horses (שָׁחֹר shachor; dusky, jetty:—black); 3 And in the third chariot white horses (לָבָן laban; white); and in the fourth chariot grisled (בדָרֹּ barod; spotted (as if with hail) and strong (ֹץמאָ 'amots; strong) horses. 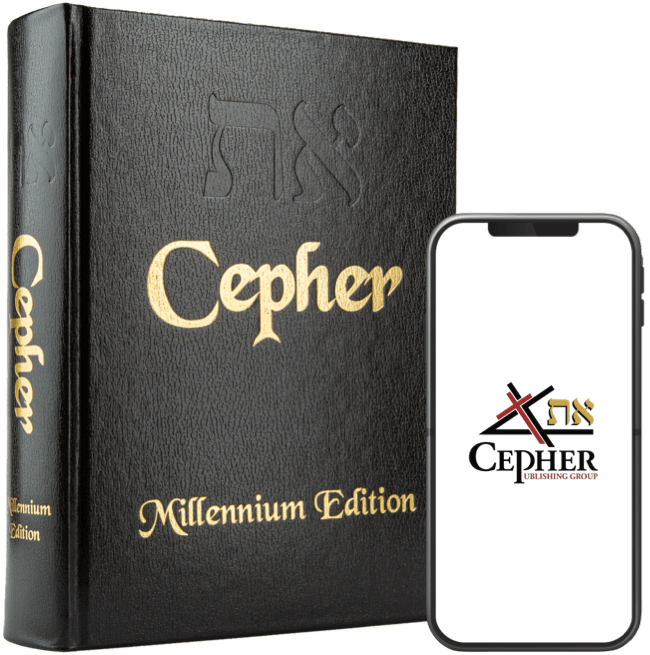 Now there are those of us who hold the opinion that the book of Chizayon (Revelation) was originally written in Hebrew. There are two witnesses within the book itself. And they had a king over them, which is the angel of the bottomless pit, whose name in the Ivriyt tongue is Abaddon, but in the Greek tongue has his name Apollyon. And he gathered them together into a place called in the Ivriyt tongue Armageddon. If in fact it was written in Hebrew, then the Greek interpreter would face the same problem as the English interpreters hundreds of years later in discovering the color of the fourth horse in Zakaryahu 6, wrestling with the words דָרֹּב barod and אמץ amots, as neither of these appear to be a color. Someone, at some point, determined that chloros or green was the best alternative. Green in Hebrew is ירק yeroq, which means the yellowish green of young and sickly vegetation; concretely, verdure, i.e. grass or vegetation:—grass, green (thing). 4 Then I answered and said unto the angel that talked with me, What are these, my lord? 5 And the angel answered and said unto me, These are the four spirits of the heavens, which go forth from standing before ADONAI of all the earth. 6 The black horses which are therein go forth into the north country; and the white go forth after them; and the grisled go forth toward the south country. 7 And the strong went forth, and sought to go that they might walk to and fro through the earth: and he said, Get you hence, walk to and fro through the earth. So they walked to and fro through the earth. 8 Then cried he upon me, and spoke unto me, saying, Behold, these that go toward the north country have quieted my spirit in the north country. For the eyes of the YAHUAH run to and fro throughout the whole earth, to shew himself strong in the behalf of them whose heart is perfect toward him. Herein thou hast done foolishly: therefore from henceforth thou shalt have wars. 8 I saw by night, and behold a man riding upon a red horse, and he stood among the myrtle trees that were in the bottom; and behind him were there red horses, speckled, and white. 9 Then said I, O my ADONAI, what are these? And the angel that talked with me said unto me, I will show you what these be. 10 And the man that stood among the myrtle trees answered and said, These are they whom YAHUAH has sent to walk to and fro through the earth. 11 And they answered the angel of YAHUAH that stood among the myrtle trees, and said, We have walked to and fro through the earth, and, behold, all the earth sits still, and is at rest. At the time of Zakaryahu’s vision, all the earth sat still and was at rest. They no longer rest by the time of the Chizayon of Yahuchanon.